Since we won’t be making a trip to Taiwan’s Jiu Fen (九份) any sooner to eat my husband’s favourite dessert: Jiu Fen Taro Balls九份芋圆, I shall make it at home. I remember very clearly the first time we travelled to Jiu Fen, we took a long bus ride there and it was raining throughout, and we have to wait for close to an hour before we were able to squeeze into an extremely crowded bus to go back to our hotel. Because of the rainy weather, it made the Taro Balls Soup more tasty. the shop we really liked was manned by an old granny. Because of the bad experience with the bus rides to and fro, I doubt we will go there any sooner especially now we have two young toddlers. What made the Taro Balls at Jiu Fen so different from other shops’ Taro Balls? The old granny’s Taro balls have the QQ texture yet didn’t stick to teeth and you really taste the Taro! 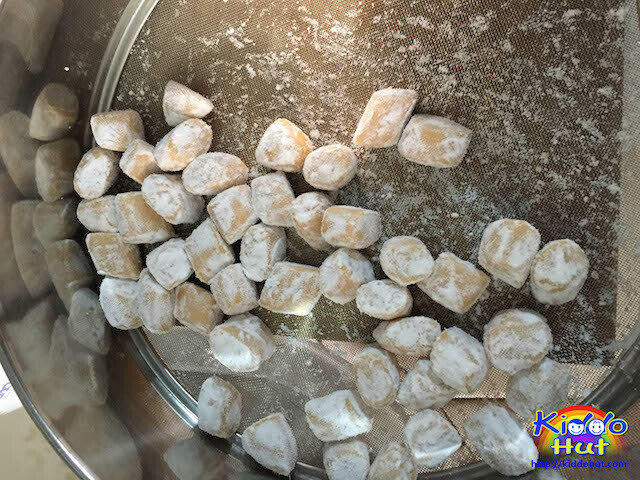 Unlike the other shops we have patronised in Singapore and some in Taiwan, what we tasted were either too soft or too chewy like chewing gum or simply too much flour. Although I eat this dessert, it is not my favourite. Since my husband has requested for it, I tried to make some. The types of flour used made the difference in texture. I searched through several recipes in the web and chanced upon this proportion of flours because I didn’t have enough sweet potato flour so I mixed in tapioca flour. (1) First try : Taro – 75% Sweet Potato Flour; 25% Tapioca Flour. Yellow sweet potato – 35% Sweet Potato Flour; 65% Tapioca Flour. Orange sweet potato – 100% Sweet Potato Flour. 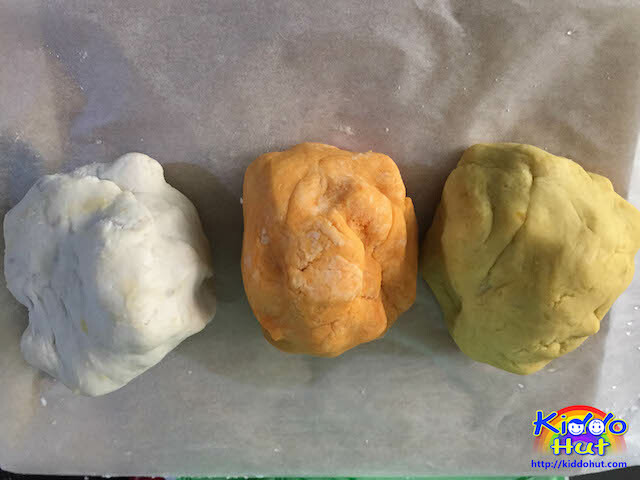 All three were coated with corn flour. (2) Second try : Taro – 75% Sweet Potato Flour; 25% Tapioca Flour. Coated with Tapioca Flour. Flour was 45% of Taro. Purple sweet potato – 65% Sweet Potato Flour; 35% Tapioca Flour. Coated with Corn flour. Flour was 55% of Purple sweet potato. Orange sweet potato – 75% Sweet Potato Flour; 25% Tapioca Flour. Coated with Tapioca Flour. Flour was 50% of Orange sweet potato. Verdict: This round the orange sweet potato is not so moist, as I used lesser flour. Out of the three, Taro was ranked top again, has the Q texture but a bit chewy. The sweet potato is slightly harder in texture compared to Taro. So, it really depends on one’s preference. 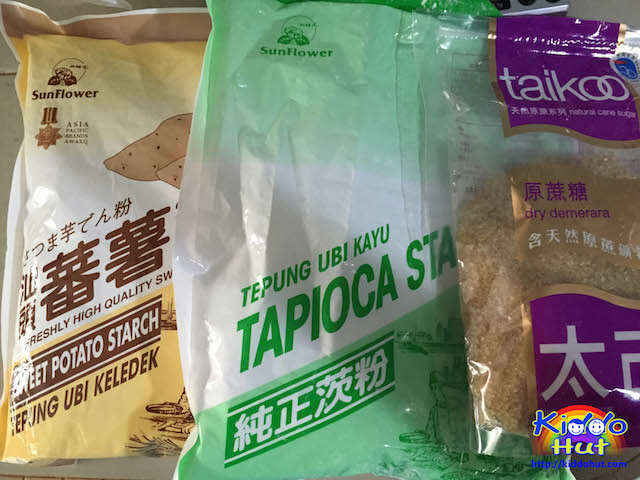 (3) Third try: Same proportion of 75% Sweet Potato Flour; 25% Tapioca Flour, for all Taro, Yellow and Orange Sweet Potato. Coated with Tapioca Flour. Flour was 40% of Taro and Sweet Potato. But, while rushing out, I accidentally left the dough near the Airpot, covered with Clingwrap which resulted to water vapour retained therein. Verdict: The tapioca coating flour gets absorbed into the dough. The balls were too chewy and taste floury. Found out that Tapioca flour thickens at lower temperature than corn flour. (4) Fourth try: Same as third try except coating changed to corn flour and kept some in fridge overnight. Verdict: Those balls that were eaten almost immediately after coating tasted a bit disintegrated. Those that were left in the fridge overnight tasted just nice and Q. Seems like corn flour coating was holding the texture yet didn’t make the balls as rubbery as Tapioca flour did. (5) Fifth try: Same as forth try, cooked some immediately after coating and let the balance stood for half an hour to an hour before cooking. To ensure I get the same texture as fourth try. Verdict: Same as fourth try. (1) Taro and yellow sweet potato moisture level is more consistent and easier to control compared to orange sweet potato which depends on the type and even same type can give rise to different moisture level which makes it difficult to control in texture. The proportion of flour to main ingredient affects the taste and texture. The amount of flour should be 40% – 45% of the main ingredient weight. Too much tapioca flour doesn’t mean the balls will be Q, it could well make it so chewy that it can just bounce up if you throw it on the floor. Without the sweet potato flour, the balls will be too soft. So, the 75%:25% proportion of sweet potato flour: tapioca flour works nice for me. E.g. for 100g Taro/Yellow Sweet Potato, I used 30g of Sweet potato flour and 10g of Tapioca flour. But again, the moisture level affects the amount of flour used. I would keep to this amount of flour as long as the dough can stand on its own. It is important to cook a bit of the dough to check the texture before adding more flour. It is recommended to err on the safe side by starting with 40%. (2) Different types of flour gives different texture, that includes the coating layer too. Sweet potato flour “harden” the main ingredient whereas Tapioca flour made it more chewy. Corn flour is the best. 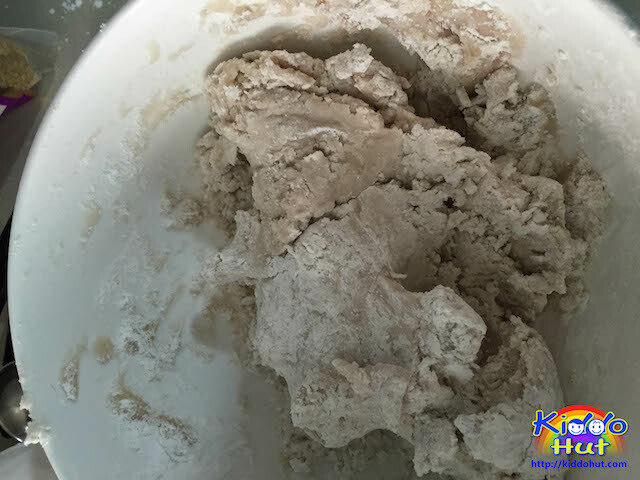 (3) If the dough is too moist, try to add a bit more of the two flours in 75%:25% proportion. Add 5g per time for every 100g main ingredient, to prevent over-addition and result to harder balls. 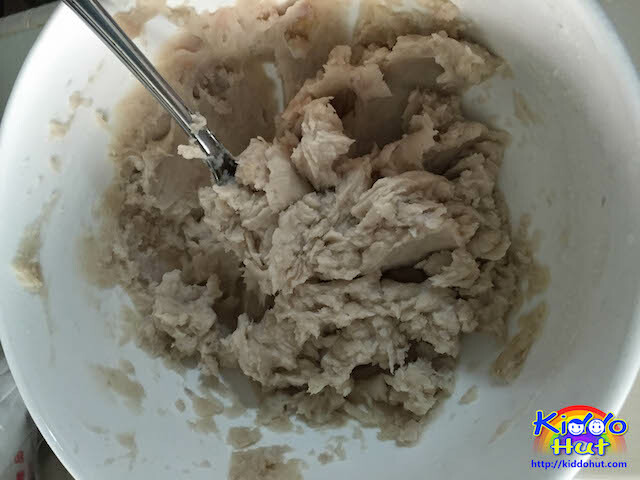 If the dough is too powdery or dry, add a little bit of water. 1/4 teaspoon per time. The dough should feel a bit moist in touch. These are my deductions from the various permutations I tried but it could difficult to be conclusive due to the moisture level. Hence, this is a dessert that doesn’t really have a recipe that tells you exactly how much flour to use. It really depends on personal preference of the texture. 1. 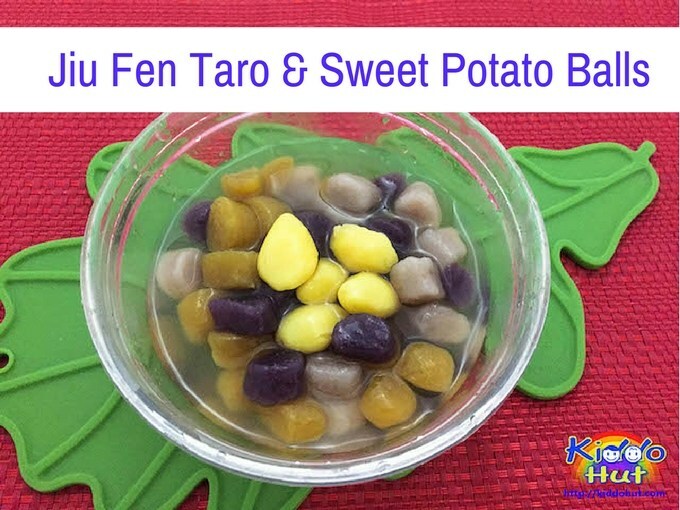 Mix the sugar and mash the Taro and sweet potato right after it is steamed to use the heat to melt the sugar. It is also easier to mash when it is hot. 2. Add a bit of water if the dough is too dry. If the flour proportion is used correctly, you shouldn’t use too much water. 1 tablespoon or two would be more than adequate. Add water bit by bit as it can make the dough very wet if little water, and you need to add more flour. 3. Cook the balls in boiling water. The balls may float within a minute, do not drain it. Let them cooked for another few minutes. Usually when the balls are floated, it means they are cooked but at times, the boiling water pushes the balls up. 4. After the balls are drained, run them through cold water quickly then add them to the bowl of dermana sugar to coat it. The sugar coating will make it look shiny and not sticking together. Let the balls seep in the syrup for some time, in this way the sweetness will seep into the balls. Of course, you can eat it just like that if you have no patience to wait. 5. Leftover balls that are not cooked, you can keep it in the freezer for later consumption. Once they are cooked, it is advisable to eat immediately. 6. I steamed the taro and sweet potato with some pandan leaves by stacking them on top of the leaves to give fragrance to the main ingredients. 7. Cook the ginger soup separately and add the balls to the serving bowl of soup. Do not cook the balls in the soup as the soup will become sticky due to the flour. You can eat the taro balls with crashed ice or glass jelly. Or even use it in bobo chacha. Have fun trying it and finding your preferred texture! Note: You need to test the texture of the balls first before cutting the whole batch of dough as the preference of texture is really dependent on individuals. 1. 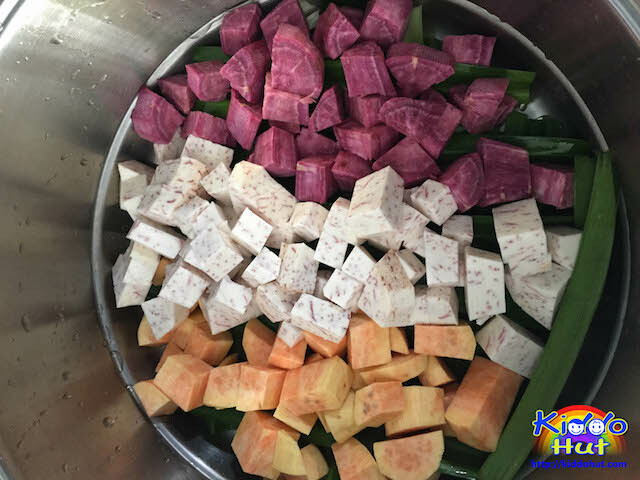 Cut the Taro / Sweet Potatos into cubes or smaller pieces. Place them on some pandan leaves and steam under high heat for 15-20 minutes until soft. 2. Add 3 tablespoons of demerara sugar on Taro / Sweet Potatos and mash them using the back of fork. 3. Add Sweet Potato flour and Tapioca flour to the mashed Taro / Sweet Potatos. 4. Knead it into dough. Add a little bit of warm water if too dry, or add a little bit of flour if it is too wet. Depends on the moisture level of the Taro / Sweet Potato to adjust the amount of flour to add. 5. Boil the water. 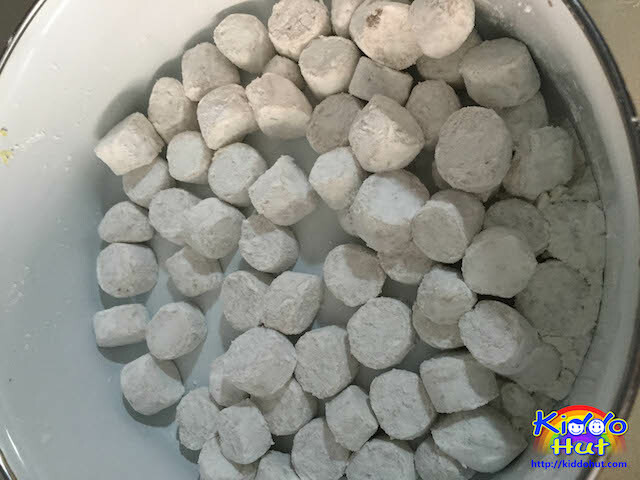 When water is boiling, pinch a bit of the dough, roll into a ball and coat it with some corn flour before putting it into the pot of boiling water. The ball will float when it is cooked. Taste to test the texture. 6. Roll the doughs to elongate and cut into 1 cm length. Do not cut too big as the dough will expand during boiling. Put some flour on the knife before cutting. 7. 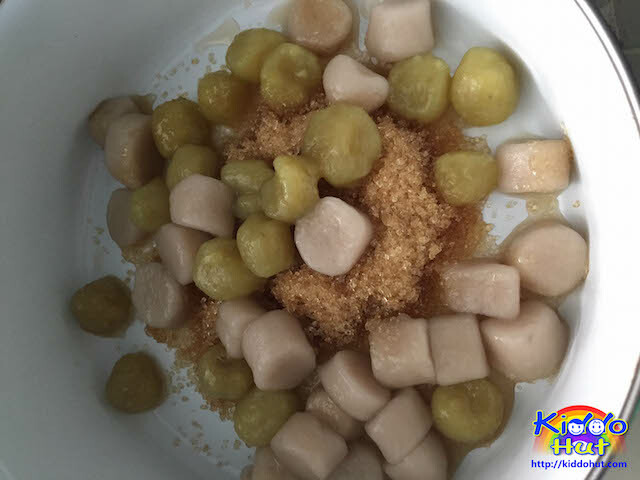 Put the cut dough balls into a bowl of corn flour and toss them to coat with the flour. Once done, sieve out the extra flour. 8. Ensure water is boiling, put the dough balls into the pot. Keep the water boiling as the turbulence prevents the balls from sticking to one another. Cook for approximately 3-5 minutes until the dough balls float on the water. If the dough balls floats immediately after putting into the pot of boiling water, just let it continue to cook. 9. Once they are cooked, drain and toss them in a bowl of demerara sugar. The heat will melt the sugar and give the balls a coat of shine. It also prevents the balls from sticking to one another. Let the balls steep in the sugar syrup for a while before using it as dessert. Preferably, let the balls steep for few hours to make it sweeter and cool them down. 11. Serve them on its own, or on a bowl of crushed ice or grass jelly, or like me, serve in the ginger soup. Refer to this post – Sweet Potato Ginger Soup to see how to make the Ginger soup. 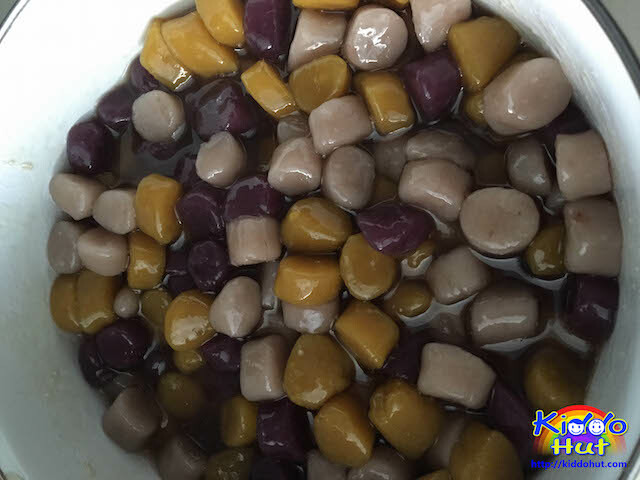 If you do not intend to cook all the Taro / Sweet Potato balls, you may keep them in zipper bag and freeze them in the freezer. Lay them flat than stacking before freezing them. There is no need to de-freeze when you want to cook them.